Evolution: Divergence & Distribution. Endress (2011a) suggested that syncarpy might be a key innovation somewhere around here; optimization on the tree is not easy. Positioning of other apomorphies is also difficult. Although the androecial feature "stamens numerous, but then usually fasciculate and/or centrifugal" is placed at the [Rosids et al. + Asterids et al.] / Pentapetalae node, there is no particular reason why it should not be placed here. If CRABSCLAW expression is found in the nectaries of Sabiaceae and Proteaceae, this, to could be placed at this node (and it would also be interesting to look at what is going on in Buxaceae, too); along the same lines, sucrose synthesis and secretion is similar in the floral nectaries of the Brassicaceae and Solanaceae examined, which are extrastaminal and gynoecial nectaries respectively (Lin et al. 2014). See also the Pentapetalae page. Chemistry, Morphology, etc. For the distinction between gynoecial (supposedly asterids only) and receptacular nectaries, see Smets (1988), Smets et al. (2003) and Erbar (2014: the two not always easy to distinguish); for a general survey of nectaries, see also Bernadello (2007). Nectary vascularization can vary between quite closely related taxa (e.g. Saxena 1973; de Paula et al. 2011). PROTEALES Berchtold & J. Presl - Main Tree. Lamina margin serrate, ?tooth morphology; stigma dry; ovules 1-2/carpel, apical, pendulous, apotropous; seed coat? ; endosperm development?, slight or 0, embryo long. - 4 families, 85 genera, 1,750 species. Age. Sauquet et al. (2009b) suggest ages for this node of around (125.1-)123.4(-119.6) Ma, Magallón and Castillo (2009) suggest ca 122.8 and 123.6 Ma, the age in Magallón et al. (2015) is about 127.5 Ma, that in Tank et al. (2015: Table S2) about 130.3 Ma, those in Zeng et al. (2017) 137-127 Ma, and that in T. Yang et al. (2018) (129.4-)122.8(-111.6) Ma, but the estimates in Foster et al. (2016a: q.v. for details), at ca 141 Ma and especially in Z. Wu et al. (2014), at ca 189 Ma, are considerably older. Evolution: Divergence & Distribution. Although the order is small, it is morphologically heterogeneous. See M.-Y. Zhang et al. (2017) for the evolution of pollen features. Phylogeny. For discussion of the monophyly and relationships of this very unexpected clade, see the eudicot node. Previous Relationships. Thorne (2007) includes the order, variously broken up, along with Buxales, in his hetereogeneous Ranunculidae, however, most authors (e.g. Cronquist 1981; Takhtajan 1997) have not seen any connections at all between the four families here. Classification. The inclusion of Sabiaceae in Proteales seems the sensible thing to do, assuming that its relationships continue to hold up (Y. Sun et al. 2015; A.P.G. IV 2016). Ovule number and embryo are similar in the combined group. Includes Nelumbonaceae, Platanaceae, Proteaceae, Sabiaceae. Woody; pentacyclic triterpenoids +, tanniniferous, benzylisoquinoline alkaloids? ; vessel elements with simple/scalariform perforation plates, bars few (-30); (true tracheids +); secondary phloem with broad or flaring rays; (sieve tube plastids also with protein crystalloids); cuticle wax crystalloids 0; stomata also paracytic; lamina venation often brochidodromous; flowers 5-merous, bracteoles ?0; P = K + C, (K) C A opposite each other, K quincuncial, with single/no trace, C quincuncial; pollen tricolporate, orbicules +; nectary +, receptacular, thin, ± lobed, annular; G connate, [2(-3], completely closed (also secretory canal), when 2, oblique or median, styluli +, terminal, short/longer, stigmas punctate, wet, no papillae; compitum +; ovules (1) 2/carpel, campylotropous or ± straight, unitegmic, single integument 3-6 cells across, nucellus apex exposed, intraovular hairs +; ?antipodal cells; fruit a drupelet to ± dry, stylulus subbasal; endocarp usu. thick, surface often ± ornamented, ; seed coat? ; endosperm helobial[? ], chalazal endosperm haustorium +, embryo curved, cotyledons folded, suspensor ± 0. 4 [list]/119 (66). Sri Lanka and South East Asia to Malesia, tropical America (map: from van Beusekom 1973; see also T. Yang et al. (2018), Sinimbu, pers. comm. Rafael Sühs). Age. Anderson et al. (2005) date crown group Sabiaceae at 119-91 Ma; (135-)129, 114(-108) Ma is the figure in Wikström et al. (2001) and (92.7-)86.2(-83.5) Ma in T. Yang et al. (2018). Fossils identified as Sabiaceae are known from the Cretaceous-Cenomanian ca 98 Ma (Insitiocarpus, c.f. Meliosma) and -Turonian (Sabia) of Europe (Knobloch & Mai 1986; Friis et al. 2011). Lianes; wood rays 0; buds perulate; leaves simple, 2-ranked [?often], lamina margins entire (minutely toothed); inflorescence various, (1-flowered), axillary; filaments flattened, anther dehiscence vertical, valvate; G fusion postgenital; drupelets 1-2, flattened, schizocarpic when 2; n = 12. 1/30. Sri Lanka and South East Asia to Malesia. Age. Crown-group Sabioideae are estimated to be a mere (19.5-)11.6(-4.8) Ma (T. Yang et al. 2018). Shrubs to trees; wood rays broad; (pits vestured - Meliosma); nodes complex unilacunar [Meliosma]; leaves spiral, imparipinnate (simple), leaflet vernation conduplicate [Meliosma], margins toothed/entire; inflorescences terminal (axillary); flowers obliquely monosymmetric, (4-merous); (K not vascularized); C ± unequal, (inner C deeply lobed); A (adnate to base of C - Meliosma), 2/5 fertile, anther dehiscence (transverse), valvate, filaments swollen apically, opposing C small, 3 staminodial; G fusion congenital, styluli not vascularized, (marginal, ovary roof + - Ophiocaryon); (integuments 2); drupelet usu. 1, asymmetrically subspherical, ridged, endocarp (splitting[? ]), (with long canal including vascular bundle); (cotyledons coiled - Ophiocaryon), (radicle folded); n = 16. Age. The age of crown-group Meliosmoideae is around (69.6-)67.3(-66.1) Ma in T. Yang et al. (2018). Sabiaceae are evergreen trees or lianes that may be recognised by the brochidodromous venation of their leaves or leaflets, their small flowers with the perianth whorls and stamens all opposite, and the more or less flattened and often distinctly ridged drupelets with more or less gynobasic styles and the surface of the stone other than smooth. Evolution: Divergence & Distribution. For various divergence ages in the family, see T. Yang et al. (2018). Pollination Biology & Seed Dispersal. Most species of Meliosma have explosively dehiscent anthers that are held under tension by the complex staminodes, but there is also a kind of secondary pollination presentation in which pollen collects on the broad connective between the anther sacs (Ronse de Craene & Wanntorp 2008; Zúñiga 2015). Wong Sato and Kato (2018) noted that the flower of M. tenuis appears polysymmetric to the pollinator; pollination cannot take place until after the two anthers explode and after the staminodes fall off, which is a day or so later. Ronse de Craene et al. (2015b) and Thaowetsuwan et al. (2017) suggested that anther dehiscence in Sabia and Ophiocaryon respectively was similar. Genes & Genomes. A genome duplication ca 9.7 Ma is associated with Sabiaceae (Landis et al. 2018). Chemistry, Morphology, etc. Sabiaceae are distinctive among members of the eudicot grade in that the perianth is differentiated into a calyx and corolla (Drinnan et al. 1994; Hoot et al. 1999) and there is a nectary that appears to be axial/receptacular (see Erbar 2014). However, the interpretation of the flower of Meliosma, especially of the nature of the perianth members, is difficult. Two sepals are smaller than the others and have been called bracteoles, as by Endress (2010c), who would then interpret the flower as being basically monosymmetric and trimerous, and the calyx whorl and the two whorls of both corolla and androecium as all alternating (one member of each is reduced). Others, e.g. Zúñiga (2015), incline to thinking of the flower as being 5-merous. According to Baillon (1874), the two carpels of Sabia are median; Warburg (1896) drew the two carpels of Meliosma as being oblique to the vertical axis of the flowers, but median to the plane between the two bracteoles; van Beusekom and van der Water (1989) show the carpels as being oblique both to the vertical axis and to the plane between the bracteoles, and the flower could be called obliquely monosymmetric. Wanntorp and Ronse de Craene (2007) illustrate the carpels as being more or less collateral, and Ronse de Craene (2010) as slightly oblique, bracteoles are not shown, but their position is described as being variable - but there is discussion as to whether or not the flowers have bracteoles. Thus Ronse De Craene et al. (2015a) noted substantial differences in the floral development of the two species of Sabia they examined that they suggest is connected to the incorporation of a bracteole into the flower in S. japonica as a "sepal", while Thaowetsuwan et al. (2017), while noting variation in size between members of the two perianth whorls in Ophiocaryon, thought that bracteoles might be absent, there being a 5-merous calyx and corolla. See also Zúñiga (2015) and in particular Sokolov et al. (2018) for more discussion on floral phyllotaxis here. There may be variation in the number of anther loculi/thecae. Ophiocaryon paradoxum has a coiled embryo; it is known as the snake nut. For a general account, see Kubitzki (2006b), for chemistry, see Hegnauer (1973, 1990), and for wood anatomy, which is very variable, see Carlquist et al. (1993). For a revision of Sabia, see van de Water (1980), for Meliosma, see van Beusekom (1971). Phylogeny. Relationships are [Sabia [[Meliosma alba + Ophiocaryon] other Meliosma]] (Zúñiga 2015: analyses of chloroplast/combined data, but not nrITS). These relationships were confirmed - and quite well supported - in the more extensive analysis of T. Yang et al. (2018: chloroplast data only), but earlier sectional groupings do not hold up. Classification. The above follows that in T. Yang et al. (2018). [Nelumbonaceae [Platanaceae + Proteaceae]]: epidermal waxes with tubules [2/3], nonacosan-10-ol the main wax; nodes? ; stipules sheathing [2/3]; connective extended beyond anther loculi. Age. Wikström et al. (2001) estimate this node to be (143-)137, 125(-119) Ma, Bell et al. (2010) suggested ages (131-)116, 110(-101) Ma, Xue et al. (2012) ages of (122.8-)109.3(-75.2[- 16.3 My!]) Ma, almost the age of fossils reliably assigned to Nelumbonaceae, Anderson et al. (2005) date this node to around 121-115 Ma and Tank et al. (2015: Table S2) to about 119.8 Ma. Magallón and Castillo (2009) and Magallón et al. (2015) suggest an age of around 117 Ma, Magallón et al. (2013) an age of around 105 Ma and Xue et al. (2012) ages of (123.8-)ca 109(-16.3) My; (125-)121.7, 119.9(-114.3) Ma are some ages in Sauquet et al. (2009b), around 120-115 Ma in Zeng et al. (2017), a low ca 82.6 Ma in Naumann et al. (2013) and a high ca 177 Ma in Z. Wu et al. (2014). The oldest fossils of this clade (Nelumbonaceae, Nelumbites) are around 107-99.6 Ma (Upchurch & Wolfe 2005; see also Doyle & Endress 2010; Friis et al. 2011). Evolution: Divergence & Distribution. Barthlott et al. (1996) noted that the cuticle waxes of Platanaceae and Nelumbonaceae were very different. However, Hayes et al. (2000) emphasised that there were only two sepals in Nelumbo, so the [Nelumbonaceae [Platanaceae + Proteaceae]] clade could be characterised as having dimerous flowers (see Doyle & Endress 2000 for Proteaceae). However, fossils assignable to Platanaceae are very variable in their floral morphologies, and some seem to have much more conventional, almost core eudicot-like flowers (von Balthazar & Schönenberger 2009). Fossils like Exnelumbites, from Late Cretaceous Mexico, have chloranthoid leaf teeth, that is, teeth with a glandular apex, a vein proceeding to the apex and joined by branches from above and below (Estrada-Ruiz et al. 2011). In the platanoid teeth of Platanus higher order veins approach but do not enter the apex, and so they are perhaps not so different from chloranthoid teeth (Doyle 2007; Estrada-Ruiz et al. 2011). Chemistry, Morphology, etc. For variation in microsporogenesis and pollen morphology, see Furness and Rudall (2004) and Denk and Tekleva (2006); successive microsporogenesis has been reported from both Nelumbonaceae and Platanaceae. Aquatic herbs, rhizomatous; mycorrhizae 0; latex, aporphine alkaloids +; radicle aborts; root stele polyarch; cork? ; plant with air canals; vascular cambium 0; vascular bundles scattered, lacking fibrous sheath; tubular P-protein and rod-shaped bodies +; nodes ? ; laticifers +, articulated; cuticle waxes as clustered tubules; prophyll adaxial; leaves vertically two-ranked, in groups of three along the stem, sheathing cataphyll on one side then cataphyll and expanded leaf on the other side; leaf peltate, lamina with a central disc, vernation involute, margin entire, venation actinodromous, midrib unbranched, other main veins dichotomising, festooned brochidodromous, stipule sheathing, open; flowers ?axillary, protogynous, large [>4 cm across], complex cortical vascular system +; K[?] 2, 4, C 10-30, spiral; A many, from a ring meristem, development chaotic, at least outer extrorse, connective with a terminal appendage, filament often with more than one bundle; tapetal cells multinucleate; microsporogenesis also successive; membranous granular layer + [innermost endexine]; receptacle massive, with emergent druses; G (2-)10-30, carpels ascidiate, immersed in receptacle, occluded by secretion, pollen canal long-papillate, stylulus 0, stigma expanded, wet; ovule one/carpel, outer integument ca 30 cells across, inner integument 8-10 cells across, parietal tissue 3-5 cells across, nucellar cap ca 4 cells across, chalaza massive, postament +, hypostase +, funicular obturator +; antipodal cells multiplying, multinucleate, persistent; fruit a nutlet, with an apical pore; seed ?pachychalazal, testa undistinguished; embryo green, differentiated, cotyledon tubular but basically two, several leaf primordia; n = 8; radicle aborting, roots adventitious. Age. Crown-group Nelumbonaceae may be (6.5-)1.6(-0.1) Ma (Xue et al. 2012). Fossil Nelumbonaceae, as Nelumbites, the leaves with rather different venation but the flowers with the distinctive expanded floral receptacle of extant Nelumbo (but different in shape), are reported from the mid to late Albian (late Lower Cretaceous) ca 107-99.6 Ma (Upchurch & Wolfe 2005; see also Doyle & Endress 2010; Friis et al. 2011; Doyle & Upchurch 2014 - also below). Nelumbonaceae are water plants that are easily recognised by their peltate leaves that are held above the water surface like parasols; the main venation is dichotomous. The broken ends of pedicels or petioles remain attached by thin, spiralling strands of congealed latex. Their flowers are somewhat like those of water lilies but have separate spherical carpels immersed in a large, obconical receptacle. Floral formula: * K 2, 4; C 10<; A many; G 10-30. Evolution: Divergence & Distribution. Like Nymphaeaceae, Nelumbonaceae were much more diverse in the past. Cretaceous fossils - probably to be assigned to stem-group Nelumbonaceae, since the leaves lack the central disc and may even have chloranthoid teeth, and the floral receptacle is shaped differently - have been placed in several species and four genera (Estrada-Ruiz et al. 2011 and references; Friis et al. 2011). Fossils of Nelumbonaceae - leaves and fruits, although not connected - are known from southern Argentina in late Upper Cretaceous rocks of Campanian-Maastrichtian age (Gandolfo & Cuneo 2005). Given the great age of the clade, 100 Ma or substantially more, Nelumbo has been called a living fossil, at least from the molecular point of view, and it also shows considerable morphological stasis (Sanderson & Doyle 2001; Xue et al. 2012). Ecology & Physiology. Vogel (2004a) provided a fascinating account of air circulation in Nelumbo, i.a. suggesting the air flows in different halves of the leaf in different directions, similarly in the petiole, and that air may move down one petiole and then up another two nodes behind on the stem (see also Matthews & Seymour 2006). The central disc has many stomata and is the site of air exchange for the petiolar canals (see also Estrada-Ruiz et al. 2011); if covered by water, air from the petiolar canals bubbles up through it. This circulation probably supplies the submersed roots and rhizomes with oxygen (c.f. Armstrong & Armstrong 2009). Pollination Biology & Seed Dispersal. The flowers are thermogenic, starch breaking down in the expanded receptacle, and halictid bees and especially chrysomelid bettles are the likely pollinators (Vogel & Hadacek 2004; Watling et al. 2006; Li & Huang 2009; Dieringer et al. 2014). The progamic phase, the time between pollination and fertilization, is notably short, as in at least some other aquatic angiosperms (including Nymphaea: see Williams et al. 2010). The sharply pointed and often six-rayed epidermal druses on the surface of the receptacle may protect it against herbivores (Vogel 2004b). Lotus fruits are noted for their longevity, and fruits 1350 ± 220 yrs old have been germinated (Shen-Miller et al. 1995). This may be connected with the chemical composition of the fruit wall which is distinctive in its high polysaccharide (galactose, mannose) and tannin content, compared to the lignin + cellulose composition of (e.g.) 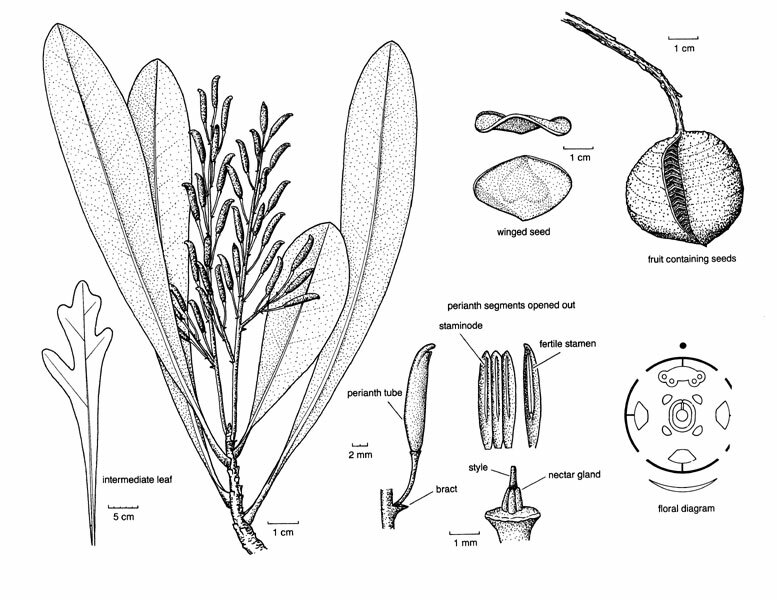 the seed coat of Nymphaeaceae (ven Bergen et al. 1997). For a water gap in the fruit, see Gama-Arachchige et al. (2013). Genes & Genomes. For the chloroplast genome of Nelumbo, see Z. Wu et al. (2014). Chemistry, Morphology, etc. Understanding how Nelumbo grows is difficult. The cataphylls more or less surround the stem and presumably represent the stipular portion of the leaf. Axillary branches show the same arrangement of leaves as described above, but with the addition of the prophyll which is on the same side of the branch as the first cataphyll. Flower buds develop in the axis of the second cataphyll, axillary branches in the axil of the expanded leaf, however, other interpretations are also possible. The sheathing stipule associated with the foliage leaf is open on the side of the stem opposite to the leaf insertion. For some literature on the growth pattern of Nelumbo, see Eichler (1878), Wignand and Dennert (1888), Miki (1926), and Esau and Kosakai (1975). Vessels arise first in the roots, but are also found in the rhizome, and the trend of their specialisation is similar; this is the monocot pattern. Details of the root cortex of Nelumbonaceae differ considerably from those in Nymphaeales (Seago 2002). Although the vascular bundles are scattered in the stem, they are inside an endodermis. For foliar venation, see Estrada-Ruiz et al. (2011). Hayes et al. (2000) noted that the two sepals are inserted in the vertical plane; Moseley and Uhl (1985) found that there may be four, decussating sepals. Although the floral vasculature is complex because of the presence of rings of cortical bundles, the vascularization of individual parts of the flower is undistinguished; the sepals may, however, have but a single trace that quickly divides (Moseley & Uhl 1985). The stamens develop from an androecial ring, and they and the carpels may be irregularly whorled (Hayes et al. 2000). Cronquist (1981) described the stamens as being introrse-latrose; Endress (1995) as extrorse, Takhtajan (1997) as extrorse (the outer members) and introrse (the others). There is also disagreement over endosperm development which has been variously described as nuclear, cellular, or helobial, and over pollen morphology (Kreunen & Osborne 1999). Some general information is taken from Williamson and Schneider (1993) and Hayes et al. (2000), for chemistry, see Hegnauer (1969, 1990: as Nymphaeaceae), for floral anatomy, see Ito (1986b), for stamens in particular, see Moseley (1958), for embryology, etc., see Cook (1909), Khanna (1965) and Batygina et al. (1982), and for seed coat anatomy, see Gama-Arachchige et al. (2013: esp. water gap). Previous Relationships. In the past, Nelumbonaceae were usually associated with Nymphaeaceae (e.g. Cronquist 1981), the two having superficially similar flowers and vegetative body (both are "water lilies") - and it turns out that floral gene expression patterns in Nymphaea and Nelumbo are remarkably similar (Yoo et al. 2010). Takhtajan (1997) removed Nelumbonaceae from Nymphaeales, but placed them alone in his subclass Nelumbonidae. Both the morphology of the cuticle waxes and plant chemistry suggest a relationship with Ranunculales, but there the waxes are nonacosan-10-ol rather than 4-10- or 5-10-diol (Barthlott et al. 1996, 2003: the difference not emphasised). [Platanaceae + Proteaceae]: woody; non-hydrolysable tannins, myricetin +, benzylisoquinoline alkaloids 0; (pits vestured); wood with broad rays [8+-seriate]; stomata laterocytic; flowers 4-merous [but see fossil Platanaceae]; P +; stamens = perianth, opposite them; carpels with 5 vascular bundles, hairy, postgenital fusion complete, stylulus long; ovules straight, inner integument 3-5 cells across; endosperm nuclear. Age. Wikström et al. (2001) estimate this node to be (124-)117, 108(-101) Ma, ages in Sauquet et al. (2009b), at (121-)114.6, 113.3(-107.6) Ma are similar while those in Bell et al. (2010), at (102-)99, 88(-97) Ma and Tank et al. (2015: Table S2), at around 93.4 Ma, are a little younger. Anderson et al. (2005) date the node to 119-110 Ma, Barker et al. (2007b) to (126.7-)118.5(-110.3) Ma, while ca 106.2 Ma is the age in Magallón et al. (2015). Age. Platanocarpus (most = Friisicarpus) is known fossil from the Lower Cretaceous 113-98 Ma (Crane et al. 1993), and other fossils are associated with Platanaceae in the constrained morphological analysis of Doyle and Endress (2010). Evolution: Divergence & Distribution. That Platanaceae and Proteaceae are sister taxa may explain why there are so many leaf fossils from the southern hemisphere that are "platanoid" in their general aspect (K. Johnason, in Drinnan et al. 1994; Hoot et al. 1999). Chemistry, Morphology, etc. The wood anatomy of Proteaceae and Platanaceae is very different, perhaps because of the different climatic conditions under which the two grow (Baas et al. 2003); however, they both have broad rays, and the former have concave vessel-parenchyma festoons and the latter concave growth ring boundaries. For stomatal morphology, see Carpenter et al. (2005). Although flowers of Platanaceae and Proteaceae look very different, von Balthazar and Schönenberger (2009; see also Ronse De Craene 2015b) suggest similarities; both consist of perianth, stamens, and fleshy structures. In Platanaceae the latter may represent an outer staminal whorl, in Proteaceae an inner whorl. This hypothesis needs further study, but if the difference in their positions are confirmed they are unlikely to be an apomorphy at this level. Growth sympodial; (plant deciduous); cork in outer cortex; nodes multilacunar; petiole bundle annular, wing bundles +; hairs candelabriform, basal cell conoid, over the junction of epidermal cells; leaves two-ranked (spiral), lamina vernation plicate-revolute, teeth glandular, with a terminal cavity, higher order veins approach but do not enter it, (margin entire), 2 strong secondary veins near base (venation pinnate; also in seedlings), petiole enclosing the axillary bud (not), stipule tubular, closed (adaxial-sheathing, open); plant monoecious; inflorescences capitate; flowers dense, sessile, small [<5 mm across], 3-4(-7) merous; P uniseriate, connate or not, often lacking vasculature; staminate flowers: outer whorl staminodial, ca 3, tiny; anthers valvate, connective with subpeltate apex; pollen semitectate-reticulate, 16-22 µm long; (pistillodes +); carpellate flowers: staminodes +; G (3-)5-8(-9), in two whorls, stigma decurrent in two crests, unicellular-papillate, ± dry; ovules 1(-2)/carpel, outer integument 3-4 cells across; fruit an achene, with basal tuft of hairs; mesotesta thick-walled, sclereidal; seed reserves hemicellulosic, endosperm moderate, embryo suspensor uniseriate, ca 4-celled; n = 16-21, chromosomes 1.4 µm long [mean]. Age. Fossils with the distinctive petiole bases of subgenus Platanus are abundant in the Palaeocene some 60 Ma (Feng et al. 2005); this puts a lower limit on the crown-group age of the family. However, leaves with such petioles may have small, fugaceous, triangular stipules very unlike those of extant taxa (Wang et al. 2011). Maslova (2010) placed Platanaceae in Hamamelidales, along with a number of fossil genera, some placed in the extinct Platanaceae-Gymnoplatananthoideae and also in Bogutchantaceae (sic) N. Maslova (= Bogutchanthaceae) - see also Hamamelidaceae). Platanaceae are a distinctive family. The leaves have leaf-like stipules completely surrounding the stem, the petiole base encloses the axillary bud, and the blades have subpalmate venation. However, Platanus kerrii is rather different vegetatively from the other species, having stipules that are more or less scarious, an axillary bud that is not enclosed by the petiole base, and pinnate venation. In all species, the bark commonly exfoliates in characteristic plates and the inflorescences are capitate and made up of numerous small flowers: the fruits are small achenes with tufts of basal hairs. Evolution: Divergence & Distribution. The morphology of fossil Platanaceae sometimes differs substantially from that of their extant relatives (see also Kvacek 2008: whole plant reconstruction; Friis et al. 2011; Midell et al. 2014). Thus the leaves may be trifoliolate (Kvacek et al. 2001a) or imparipinnnate/ly lobed (= Sapindopsis: for this genus, see Doyle 2014b; Sender et al. 2016 and references), and inflorescences may have sessile or pedunculate heads. In Upper Cretaceous plants there is extensive floral variation: staminate flowers = P 4, basally connate, stamens equal and opposite perianth members and arising from a short ring of tissue, alternating with ?staminodes, perhaps of an outer whorl, or two 4- or 5-membered whorls of perianth present, A 5, pistillode consistently present, or P in 2 whorls, connate, outer more or less completely so, or free; G 8, 2 opposite each member of inner perianth, ovules perhaps anatropous, stylulus 0. Mindell et al. (2014) described the Late Cretaceous Ambiplatanus with very small heads and some perfect flowers; the 5-merous perianth was in two whorls with the stamens opposite members of the inner whorl (no comment was made about this position) and also the carpels - the latter had no style, and it is possible that the seeds were winged and the fruit dehiscent. The Middle Cenomanian Verneda hermaphroditica has, as its name implies, perfect flowers, also a perianth with at least three whorls, filaments that are fused basally, and a eusyncarpous and pentalocular gynoecium, yet it is placed in this area in morphological analyses (Moreau et al. 2016: esp. pp. 833-834). Some fossils have rather smaller pollen that that of extant taxa - are they wind-pollinated? - insect pollination is the suggestion for some of them. Tricolporate pollen has even been found in situ in fossils assigned to Platanaceae (e.g. Manchester 1986; Crane et al. 1993; Pedersen et al. 1994; Friis et al. 1988, 2011; Magallón-Puebla et al. 1997: Mindell et al. 2006: Crepet et al. 2004; von Balthazar & Schönenberger 2009; Taylor et al. 2009; Doyle & Upchurch 2014 for other references). Cretaceous Platanaceae do not have hairy fruits (von Balthazar & Schönenberger 2009; Friis et al. 2011), and the fruits may even be follicles (Crane et al. 1993). From the molecular point of view, at least, Platanus can be considered a living fossil (Sanderson & Doyle 2001). Subgenus Castaneophyllum (Platanus kerrii, from Thailand) differs in lamina morphology, venation, petiole base and stipule morphology from subgenus Platanus. Ecology & Physiology. In the Late Cretaceous-Miocene Platanus was a common plant of disturbed streamside habitats; frequent associates included Ginkgo, Metasequoia and Cercidiphyllum (Royer et al. 2003); for further details see above. Some species of Platanus grow in such habitats today. Pollination Biology. There is about five weeks between pollination and fertilization in Platanus racemosa, at least (Floyd et al. 1999). Genes & Genomes. There is some evidence from the stomatal size of fossils that polyploidization occurred within this clade (Masterson 2004). Chemistry, Morphology, etc. Hennig et al. (1994) described the cuticle wax as lacking crystalloids, Fehrenbach and Barthlott (1988) as having rodlets and platelets. There is some variation in stomatal morphology (Carpenter et al. 2005). Platanoid leaf teeth are supposed to be a variant of chloranthaceous teeth (for which, see e.g. Nelumbonaceae) in which the accessory veins approach but do not fuse with the central vein which ends in the tooth (Doyle 2007; Estrada-Ruiz et al. 2011). Von Balthazar and Schönenberger (2009) described the parts of the flower as alternating regularly; the androecium was biseriate, the outer, very much reduced whorl appearing late in development. Developmental studies suggest that flowers of Platanus are basically 4-merous (A. Douglas in Hoot et al. 1999). Some information is taken from Kubitzki (1993b); see Floyd et al. (1999) and Floyd and Friedman (2000) for embryology and endosperm development and Denk and Tekleva (2006) for pollen of extant and fossil taxa. See Smets (1986) for nectaries, Melikian (1973) and Takhtajan (1991) for testa anatomy, and Floyd et al. (1999) for embryology; for chemistry, see Hegnauer (1969, 1990), and for vegetative characters, see Doyle and Upchurch (2014). Phylogeny. For a phylogeny of Platanus, see Grimm and Denk (2008). Previous Relationships. Platanaceae were included in Hamamelidales by both Cronquist (1981) and Takhtajan (1997). Trees or (acaulescent) shrubs; lateral roots of limited growth, forming clusters [= proteoid roots, ?level], plant rarely mycorrhizal; vessel elements with simple perforation plates (scalariform, bars few); true tracheids and libriform fibres +; phloem stratified or not; nodes (1:1), 3:3, 5:5; petiole bundles numerous, pattern complex; sclereids common; hairs with 2 short cells, one in epidermis, with doughnut-shaped base, apical cell elongated, bifid or not; stomata parallel to long axis of leaf; leaves spiral (opposite), (odd-pinnately, rarely palmately, compound or lobed), lamina often coriaceous, vernation usu. conduplicate, margins spiny toothed to entire, base of petiole often swollen, stipules 0; inflorescence various; flowers 4-merous; P petal-like, valvate, decussate-diagonal; (connective appendage 0); tapetal cells binucleate (uninucleate - Macadamia); microsporogenesis also successive, cleavage centrifugal; pollen triangular in polar view, oblate, triporate, pores broadly operculate, apertures in threes at four points of the young tetrad [Garside's Rule], (colpate), tectum forms pore membrane, foot layer forming irregular blocks, exine with ektexine only, endexine 0; G 1, orientation adaxial, stigma terminal or lateral, often slit-like, secretory; ovules long, vascular bundles forming a ring in the chalazal region, outer integument 2(-9) cells across, inner integument 3-4(-6) cells across, parietal tissue (?0-)2-16 cells across, nucellar cap 2-7 cells across, ± endothelial, hypostase +; (antipodals not persistent); (exotesta +), endotesta palisade, crystalliferous, (exotegmen fibrous); cotyledons large, embryo suspensor 0. 80 [list]/1,615 - five subfamilies below. Largely southern hemisphere, esp. Australia and S. Africa (map: from Johnson & Briggs 1975; Trop. Afr. Fl. Pl. Ecol. Distr. 1. 2003; Weston 2006; Prance et al. 2007). Age. Anderson et al. (2005) date crown-group Proteaceae at 96-85 Ma, Barker et al. (2007b) at (126-)118(-110) Ma, (97-)91.4, 88.2(-82.6) Ma is the estimate in Sauquet et al. (2009b: Bellendena sister to Persoonioideae) and (115.5-)107.2(-96.1) Ma in Onstein et al. (2016). Hill et al. (1995) and Weston (2006) summarize the fossil record of the family, Carpenter (2012) that of leaf fossils. Leng et al. (2005) discuss small but mature capsular fruits from late Cretaceous (late Santonian/early Campanian) Sweden which have several attributes of Proteaceae, e.g. the flowers are paired, the stigma is somewhat abaxial on the fruit. However, there are also differences, e.g. there are only three vascular bundles per carpel and there seems to be little in the way of a perianth; one species has the most remarkable papillate seeds. Proteaceae fossils are known from sediments ca 94 Ma old in Australia, i.e., shortly after the separation of Australia from Antarctica some 97 Ma (Hill & Brodribb 2006). Plants Al-accumulators; inflorescence terminal, bracts 0; ovules 2/carpel; fruit dry, indehiscent, 2-winged; n = 5, chromosomes ca 6.7 µm long, nuclear genome size ca 1 pg DNA (means). 1/1: Bellendena montana. Australia (Tasmania). [Persoonioideae [Grevilleoideae + Symphionematoideae + Proteoideae]]: stomata brachyparacytic; P connate; A adnate to P, more or less sessile; nectary +, receptacular, ± vascularized, [(2-)4-lobed, annular, unilateral]; stylulus long; endosperm +; (cotyledonary blade cordate). Age. Wikström et al. (2001) estimated that this node was (67-)60, 47(-40) Ma old. Proteoid roots 0; tepals with Vorlaüferspitze, 1-2(+) ovules carpel; fruit a drupe (follicle - Placospermum); cotyledons obreniform; n = 7, chromosomes 9.1-14.4 µm long, nuclear genome size 2.5-4.3 pg DNA (means). 4/110. Australia, New Caledonia and New Zealand. Age. This clade may be (84.1-)72.3(-60.5) Ma (Barker et al. 2007b) while (66.3-)49, 47.2(-31) Ma is the age in Sauquet et al. (2009b). 1/1: Placospermum coriaceum. N.E. Queensland, Australia. 3/109: Persoonia (100). Mostly Australia, also New Caledonia and New Zealand. Age. The age of this clade is (38-)22.2, 20.8(-10) Ma (Sauquet et al. 2009b) or (79.1-)45.7(-21.6) Ma (Onstein et al. 2016). Pollen of the Persoonieae is known from the later Cretaceous (Maastrichtan) onwards (Dettmann & Jarzen 1998). [Grevilleoideae [Symphionematoideae + Proteoideae]]: (tyrosine-derived cyanogenic glycosides +); T orthogonal [?level]; flowers vertically or obliquely monosymmetric [P split to base on one side (4:0), or 3 P connate, 1 free (3:1)]; (secondary pollen presentation, the apex of the style bearing the pollen); (ovules anatropous); x = 14, chromosomes 0.5-5 µm long, nuclear genome size 0.05-0.27 pg DNA (means). Age. This clade is some (93.7-)88.3, 86.2(-80.8) Ma (Sauquet et al. 2009b). Plants Al accumulators; sieve tubes with rosette-like non-dispersive protein bodies; (hairs biramous); stomata randomly oriented [parallel - Sphalmium]; paired flowers subtended by a common bract (not); (A not adnate to P), pollen diporate, (boomerang-shaped), also with abundant endexine, also in the apertural region; (carpel orientation diagonal), stigmatic head swollen ellipsoid to disciform [Lomatia]; ovules (1-)2+/carpel; fruit a drupe or follicle, the latter with winged seeds [wing from outer integument], (serotiny: fruits massive, woody); seeds (pachychalazal), (endotestal cells short); endosperm with nuclear chalazal haustorium; cotyledons basally auriculate; n = (10-)14(-15), chromosomes 1-2.6µm long [mean]. Age. Crown-group Grevilleoideae are some (86.1-)80.4, 78.1(-73.8) Ma (Sauquet et al. 2009b) or (109.6-)90.1(-87.2) Ma (Onstein et al. 2016). Pollen from 4/7 tribes of Grevilleoideae is known from the Cretaceous (Dettmann & Jarzen 1998). [Symphionematoideae + Proteoideae]: fruit indehiscent. Age. This clade is some (90.4-)85.1, 83.6(-78.3) Ma (Sauquet et al. 2009b). Proteoid roots 0; T orientation? ; nectaries 0; ovules 1-2/carpel; fruit dry; n = 10. 2/3. S.E. Australia, inc. Tasmania. Age. The crown-group age of this clade is slightly less than 80 Ma (Barker et al. 2007b), (70.3-)56, 44.9(-20.5) Ma (Sauquet et al. 2009b), or (78.4-)25.0(-7.3) Ma (Onstein et al. 2016). (Herbaceous), (plants Al-accumulators); sieve tubes with non-dispersive protein bodies; flowers sessile; (hypanthium +); T free, (A 1-3), (anthers monothecal); ovules 1(2)/carpel), (bistomal); fruit often single-seeded, drupe or nut, (serotinous), (surrounded by bracts, branches); n = (10-)11-13(-14), chromosomes 1.2-3.4µm long [mean]. 25/655: Protea (115), Leucadendron (96), Conospermum (55), Petrophile (55), Synaphea (55), Serruria (50). Africa S. of the Sahara, esp. the Cape region, Australia. Age. Proteoideae are estimated to be some (86.4-)80.6, 80.6(-75.3) Ma (Sauquet et al. 2009b), or (92.2-)85.5(-74.8) Ma (Onstein et al. 2016). Eidithoea Beauprea, Sterlingia etc - endexine not, #2 pollen tricolpoidate. Proteaceae are woody plants that may be recognised vegetatively by the broad rays in the wood, the surface of which is often furrowed even in the twigs, the often rather scleromorphic and coriaceous leaf blades with rather distant (or no) teeth and prominent veinlet reticulum, the swollen leaf base and the sometimes rather short petiole (which is then bottle-shaped), and the brown indumentum. The plants smell musty. The 4-merous flowers are often aggregated into conspicuous inflorescences; the perianth is brightly coloured and petaloid and may be monosymmetric and curved; and the stamens are opposite the perianth members. There is only one carpel and it often has a long style. Floral formula: */⚥ T [2 + 2]; A 4; G 1. Evolution: Divergence & Distribution. For additional ages of clades within Proteaceae, see Sauquet et al. (2009b: Table S2) and Onstein et al. (2016). There is a great diversity of proteaceous pollen from the late Cretaceous (Campanian-Maastrichtian) in central and southeast Australia (Dettmann & Jarzen 1991, 1998; see also Friis et al. 2011), and Proteaceae seem to have been very diverse and ecologically important in at least parts of Australia (see also Itzstein-Davey 2004; Lamont & He 2012, but c.f. Hill & Jordan 2016 in part; Carpenter et al. 2015), Patagonia (Barreda et al. 2012), southern Africa (Scholz 1985: Namaqualand), the Antarctic Peninsula (Bowman et al. 2014), and elsewhere in Gondwana by the later Cretaceous. Kooyman et al. (2014) discuss earlier possibly wider ranges of southern proteaceous genera. Thus He et al. (2016a) suggested that Beauprea (Proteoideae), known fossil - it has distinctive pollen - from throughout eastern Gondwana (including New Zealand up to 1 Ma), but now known only from New Caledonia, was on Zealandia 82 Ma as it split from Gondwana, and so was an original inhabitant both of New Caledonia and New Zealand (see also Beaupreopsis). Although some transoceanic disjunctions in the family, for example, that of the sister taxa Cardwellia in Australia and Gevuina in South America, could reflect vicariance/continental drift events, others, like Brabejum in Africa which is sister to Panopsis in South America, involve genera whose estimated time of divergence is later than the geological events that might seem to have caused their distribution patterns (Barker et al. 2007b). The crown-group age of Embothrieae was estimated at around 70.8 Ma (Milner et al. 2015; 68.1-66.6 Ma in Sauquet et al. 2009b), but although current distributions of Lomatia and Embothrium/Oreocallis are Gondwanan, at least some details of diversification are unconnected with the breakup of Gondwana (Milner et al. 2015; see also Weston & Crisp 1994). There has been extensive extinction of Proteaceae in New Zealand (Lee et al. 2001). Reyes et al. (2014) found that Proteaceae had diversified in hotspots of Mediterranean diversification (for the age of such vegetation, see He et al. 2016b and references). Floral monosymmetry seems to have led to both enhanced speciation and extinction, so overall no change (Reyes et al. 2014). Sauquet et al. (2009b, q.v. for much more detail, note topology) compare diversification in the Cape and S.W. Australian hotspots, and find that although more clades are to be found in the latter area, not all of them diversified much. Fires may have spurred diversification, as in Banksia, where flower retention on inflorescences and leaf retention on plants may increase the intensity of fires, even if exactly how this might benefit a species is not entirely clear (He et al. 2011; see also Bond & Midgley 1995). Fire-dominated eucalypt vegetation may have begun to develop in Australia in the earliest Caenozoic, a little before Banksia diversified (Crisp et al. 2011), but heath vegetation with numerous Proteaceae, including Banksia (but no Myrtaceae), and evidence of fires from Central Australia has been dated to around 89-65.5 Ma (Lamont & He 2012; Carpenter et al. 2015; see also below). Several lines of molecular evidence suggest that there may have been rapid diversification within Grevilleoideae (Hoot & Douglas 1998). The stem age of the very largely Australian Banksieae is estimated at (94.9-)87.9(-80.9) Ma (Barker et al. 2007b, q.v. for other ages). Banksia itself may be ca 60.8 Ma old, the crown group (56.9-)44.5(-36.6) Ma (He et al. 2011). More recent diversification within Banksia may have been instigated by vicariance events such as the aridification of the Nullarbor Plain some 14-13 Ma which led to the separation of what became eastern and western clades (Crisp & Cook 2007; see also Ladiges et al. 2012). However, although it is diverse in areas with Mediterranean climates, it does not seem to have undergone particularly rapid speciation, rather, unexceptionable rates over a long period of time may be the cause (Cardillo & Pratt 2013). Crown group Hakea s. str. (ca 150 species) may be as young as (14.0-)9.6(-6.4) Ma (Mast et al. 2012, see also 2009), although Lamont et al. (2016a) suggested an age of around 14 Ma while Hanley et al. (2008) and especially Mast et al. (2015) suggested ages in excess of 20 Ma. The origin of this clade may be in southwest Australia, and there may have been around twelve west to east movements in the clade, indeed, it has been estimated that there have been around 47 shifts from one biome to another, a remarkably high number when compared with other Mediterranean taxa, including Banksia and Protea (Cardillo et al. 2017; Skeels & Cardillo 2017); one could argue that phylogenetic niche conservatism is an alien concept here. Interestingly, leaf fossils of Eocene-Miocene Persoonioideae-Persoonieae are hypostomatic, while most extant species are amphistomatous, the plants then probably growing in more open habitats - and perhaps in communities unlike those in which Persoonieae are now generally found (Carpenter et al. 2017). Hakea s.l. is very diverse in S.W. Australia, where there are around 315 species, and it may have begun speciating in excess of 35 Ma; diversification is most rapid in a clade of Hakea s. str. rather than in Grevillea s. str. (Mast et al. 2015). Extensive studies have been carried out on the interaction between traits such as serotiny, spiny leaves, pollination by meliphagids, fruit size, conspicuousness and aggregation, and seed predation by cockatoos in S.W. Australian species of Hakea s. str.. It transpires that large fruits, even if conspicuous and not protected by spiny leaves, etc., are largely impervious to the attention of cockatoos despite these fruits being serotinuous and so remaining on the plant for a long time (even decades); the flowers of such plants were often pollinated by meliphagids, features such as non-spiny leaves, etc., allowing them easy access to the flowers (Lamont et al. 2016b). Protea, speciose in southern Africa with some 70 out of its 115 species being restricted to the Cape, has been studied by Barraclough and Reeves (2005), although they found it difficult to pin down dates for diversification there. Sauquet et al. (2009a, b) suggest that diversification in Protea may have occurred within the last 18 Ma although it may have been there since the late Cretaceous, yet Leucadendrinae had started diversifying in southern Africa as much as 39 Ma, even though they had been in the Cape region itself for a shorter time than Protea; there had been considerable diversification within Proteoideae even back the Cretaceous (Sauquet et al. 2009b, see also Linder 2003: ca 270 spp. in Cape Floristic Region). On the other hand, Schnitzler et al. (2011; Mitchell et al. 2017 for a phylogeny) thought that diversification in Protea began ca 28 Ma in the middle of the Oligocene and was connected with edaphic (soil mediated) speciation; rates of diversification throughout its range were similar (Valente et al. 2010b; see also Silvestro et al. 2011; Lamont et al. 2017). Mitchell et al. (2018) found a number of associations between various aspects of vegetative construction and temperature, elevation, rainfall, and the like in the diversifiction of Protea, thus plant and leaf size are positively correlated with temperature and leaf construction costs are negatively correlated with rainfall. Tonnabel et al. (2014a) examined the evolution of various life history traits in Leucadendron (see also Barker 2004). They found frequent trade offs between traits, so if, for example, the seeds of a particular species commonly dispersed quite a distance, its pollen was not so likely to be well dispersed. Stomatal size could easily be added to the list of characters, but it is in part correlated with chromosome number, etc. (Carpenter et al. 2010a). Ecology & Physiology. Proteaceae are most diverse in rather dry climates on nutrient-poor old soils in Australia, especially phosphorus (P) poor soild (see also Orians & Milewski 2007) and southern Africa, however, salt tolerance is uncommon (Flowers et al. 2010). It is estimated that fire-proneness in Proteoideae arose around 90 Ma, with a variety of fire-associated traits evolving over the next 20 My or so (Lamont et al. 2018). Fire-adapted and Proteaceae-dominated heathlands in Australia have been dated at ca 89-84 or 75-65.5 Ma (Lamont & He 2012; Carpenter et al. 2015 respectively), temperature and atmospheric oxygen concentrations being high then. There were numerous species of Proteaceae in these early heathlands, judging by pollen and vegetative remains, Proteoideae and Grevilleoideae being prominent components of the vegetation, and Banksia may have evolved by then, however, neither Eucalyptus nor other Myrtaceae were recovered in the deposits examined. This suggests that the sclerophyllous biome is much older than previously thought (Carpenter et al. 2015; c.f. in part Lamont & He 2012); perhaps surprisingly, Sphagnum was a important component of this vegetation, although it is not to be found in such places today and crown-group Sphagnum may be only 104-30 Ma (Shaw et al. 2010a) or a mere ca 25 or even 14 Ma (Shaw & Devos 2014). For fire in Australia, see Bradstock et al. (2012), Bowman et al. (2012), Hill and Jordan (2016), c.f. in part Bond and Scott (2010). Many species of Australian Proteaceae grow in fire-prone habitats, and they have thick leaves, serotiny, wind-dispersed seeds and germination stimulated by heat and smoke, and resprouting is also common. Pausas and Lamont (2018) integrate these and other variables (soil, biotic) in their analysis of the ecological proclivities of the family in Australia. In the Cape area, the speciose Protea diversified 34-22 Ma, initially in winter-wet shrublands where sclerophylly and serotiny were favoured. The genus moved in to summer-wet grasslands where larger leaves (and stature), and especially non-retention of seeds and resprouting, were favoured, speciation beginning (10.7-)7(-3.3) Ma (Lamont et al. 2013: surely P. sulphurea plesiomorphically a shrubland species?). Lignotubers, common in plants growing in habitats where fire is common, have evolved several times in Proteaceae, and Lamont et al. (2017) discuss the role that fires, not frost, are likely to have had in the evolution of subshrub geoxyles, i.e. subshrubs with lignotubers, in African Protea in the last 11 Ma. Proteaceae are notable in having a relatively large seed mass and both very low leaf nitrogen (N) and high leaf mass per area (i.e. they have a low SLA), the latter features tending to be linked (Cornwell et al. 2014). From examination of fossil leaves, scleromorphy may have evolved in the late Palaeocene, xeromorphy in the late Eocene/Oligocene (Hill 1998; Hill & Brodribb 2001). Jordan et al. (2005, 2008) outline the evolution of scleromorphic leaf anatomy, in particular, aspects of stomatal morphology like sunken stomata, associated papillae, etc., and amphistomaty is common. Sclerophylly itself is implicated in photoprotection and occur in association with some combination of open, oligotrophic, cold and dry conditions, while sunken stomata help reduce water loss (Weston 2014); genera like Hakea s. str. are extreme sclerophylls (Lamont et al. 2016a). The family as a whole shows great variation in aspects of leaf anatomy and morphology like cell size, stomatal and fine vein density, leaf size and thickness, that affect productivity, transpiration, etc. (Brodribb et al. 2013), interestingly, there is no simple correlation between productivity and success. Bellendena, perhaps sister to the rest of the family (see below), has medium-sized stomata, while Persoonioideae (perhaps sister to Bellendena) and Protea in particular have large stomata and other anatomical features that are common in taxa of more open habitats (Brodribb et al. 2013). Aspects of leaf anatomy that facilitate the movement of water through the leaves are correlated with annual precipitation (Jordan et al. 2013). The phosphorus (P) metabolism of Proteaceae is very distinctive, even if much still remains to be understood (Lambers et al. 2015a, b, c). Proteoid/cluster roots are short-lived (around a month) bottle-brush like clusters of roots of determinate growth, and these clusters may represent a single order of branching of the subtending root, or they may be more complex (e.g. Dinkelaker et al. 1995; Laliberté et al. 2015). They account for up to 50% to perhaps 80% of the mass of all the roots of a plant at any one time, a single cluster having a surface area 25 times that of an equivalent mass of axial roots, root hairs excluded (Shane & Lambers 2008; see also Purnell 1960; Dinkelaker et al. 1995). These roots are initiated opposite the xylem poles of the main root, and in Hakea prostrata they form up to seven longitudinal rows down the root (the rows may be double). Although cluster roots eventually lose their root caps and so are determinate in growth (Watt & Evans 1999; Shane et al 2004b), the caps - perhaps of young roots - are also described as secreting considerable amounts of mucilage (Dinkelaker et al. 1995). They exude organic acids like citric acid, especially as tricarboxylates, into the soil, and this enables the plant to mobilize phosphate and perhaps other nutrients like manganese that are at a premium in the P-poor soils on which Proteaceae often grow (Watt & Evans 1999; Shane et al. 2004b; Weston 2006; Lambers et al. 2015c); they are phosphorus miners (Lambers et al. 2008). Interestingly, proteoid roots may form in response to the presence of organic matter near the root (Watt & Evans 1999 and references). (They also develop in Lupinus, Arabidopsis and a number of Fagales, etc., under conditions of low P and as soils age - López-Bucio et al. 2003; Lambers et al. 2008; Turner et al. 2013; Kang et al. 2014: development of proteoid roots in Arabidopsis, while in other taxa long root hairs are the response of the plant to low inorganic P - Lambers et al. 2015c; Salazar-Henao et al. 2017.) Furthermore, when P becomes scarce Proteaceae may remove the P component of their cell membranes (as phospholipids) and divert it to maintaining their photosynthetic rates (Lambers et al. 2012a, b), while species of Banksia and Helicia in particular show very high levels of P resorbtion prior to leaf senescence (Denton et al. 2007; see also Hayes et al. 2014; Lambers et al. 2015b). Interestingly, many members of the family develop P toxicity when growing on relatively P-rich soils; they cannot down-regulate their uptake of P, and it accumulates in palisade mesophyll cells in particular, eventually causing the death of the plant (Shane et al. 2004a; Shane & Lambers 2008; Lambers et al. 2011 for a general summary). Particularly in Australia, and there perhaps particularly in resprouting/serotinous species, P is preferentially moved into the seeds (Denton et al. 2007; Groom & Lamont 2009). Late leaf greening and development of higher levels of rRNA, changes in levels of foliar lipids over time, very high efficiency of use of P (and N) in photosynthesis, etc., are additional factors that contribute to this distinctive P metabolism (Lambers et al. 2015b: list on p. 1). In South America soils may be richer in P, but it is not readily available (Lambers et al. 2012b). However, cluster root formation in the Patagonian Embothrium coccineum was induced by low nitrogen rather than low P, even if P uptake was also subsequently enhanced (Piper et al. 2013; see also Delgado et al. 2014). Lomatia tasmanica appears to be represented by a single clone about 1.2 km across; only recently the same clone may have been far bigger, ca 6 km across, and fossil records suggest that it may be up to 43,600 years old (Lynch et al. 1998). Pollination Biology & Seed Dispersal. Pollination in Proteaceae is not very well known. However, brush-type secondary pollen presentation involving various regions at the apex of the style is common (Sedgley et al. 1993; Ladd 1994), and the pollen may even initially cover the stigma, sometimes mixed with cells that have become detached from the stigmatic surface and whose walls have spiral thickenings (Ladd et al. 1996, 1998), the stigma itself often being slit- or groove-like; however, selfing is uncommon. Tilney et al. (2016) suggested that there might be interactions between onci/pollen buds known from the pollen grains of some Proteaceae with epidermal cells of the pollen presenter, perhaps involving the hydration of the pollen grains. Monosymmetric flowers are common the family, monosymmetry having evolved 10-18 times or more here, with 4-12 reversals (Reyes et al. 2016; Citerne et al. 2016: CYC-like genes involved). The Cape species Mimetes cucullatus has monosymmetric groups of flowers, the pendulous polysymmetric flowers being borne under a more or less brightly coloured inflorescence bract. The inflorescences of some species of the Australian Conospermum (Proteoideae) look rather like those of Anigozanthus (Haemodoraceae). There are about 1,100 Australian species of Proteaceae, and many, including members of the large genera Grevillea (?to be included in Hakea) and Banksia, are likely to be pollinated by birds (Maynard 1995). Thus it has been suggested that ca 300 species of Proteaceae in Australia may be bird-pollinated (Ford et al. 1979), but this is likely to be an underestimate; a moderately conservative estimate is that there are ca 350 species of bird-pollinated Proteaceae there (E. T. Miller pers. comm. 12.ii.2017). Two recent studies have examined bird pollination in Hakea s. str., its evolution and possible relationship with cyanogenesis in the flowers. From the phylogeny provided by Mast et al. (2012), insect pollination would seem to be derived from bird pollination, while Hanley et al. (2008) suggested the opposite, however, the phylogeny of the latter was based on an earlier morphological study that could not be confirmed by Mast et al. (2012). Dates, as well as a possible association between pollinators and the presence of cyanogenic glycosides suggested by Hanley et al. (2008) also need confirmation, but see Mast et al. (2015). In southern Africa perhaps 87 species of Proteaceae in the Cape Fynbos are pollinated by a few species of nectariniids, and particularly by the sugarbird, Promerops cafer (Promeropidae) (Rebelo et al. 1984: Rebelo 1987); there are two species of Promerops, one of which is more broadly distributed in Africa, as are Proteaceae themselves (the Promerops clade is quite old, around 39-33 Ma - Beresford et al 2005; Fleming & Kress 2013). In both Australia and the Cape, the prominence of ornithophily in the family may be connected with the nutrient-poor soils on which Proteaceae there grow; nectar - basically C, H, and O - costs the plant little (Rebelo 1987; Orians & Milewski 2007). In both Australia and southern Africa non-flying mammals (rodents, marsupials) are among the pollinators (Collins & Rebelo 1987). Pollination in the speciose Persoonia, an Australian genus that lacks secondary pollen presentation, was found to be by bees (Bernhardt & Weston 1996). The large Cape genus Leucadendron, dioecious, is commonly pollinated by nitidulid beetles, although a few species have become wind-pollinated (Welsford et al. 2016 and references). Serotiny is scattered in the family (see also above), the follicles opening only after a fire. Banksia is a major serotinous clade, although with some reversals (He et al. 2011: Dryandra not included, other features associated with serotiny examined). A number of the species involved have massive fruits, but there are only two seeds inside, while in other taxa the fruit is enclosed by bracts, branches, etc.. For myrmecochory in Hakea s.l., Leucadendron, etc. (Grevilleoideae and Proteoideae), see Lengyel et al. (2009, 2010), it may have first originated in Proteaceae (58-)44.5(-32) Ma (Lamont & He 2012). Plant-Animal Interactions. Given the size of the family, caterpillars of Lycaenidae butterflies seem to eat its members quite frequently (see Fiedler 1991). Caterpillars of the dryandra moth, Carthaea saturnioides, the only member of a family close to the saturnines, are found only on Proteaceae. Bacterial/Fungal Associations. In Australia, the fungal pathogen Phytophthora cinnamomi is proving especially destructive to members of this family in the Mediterranean climates of the southwest. The African Faurea saligna is reported to be ectomycorrhizal (Högberg & Piearce 1986), but absence of mycorrhizae seems to be the common condition here, interestingly, other plants lacking mycorrhizae are most often herbaceous, unlike Proteaceae (Maherali et al. 2016). Vegetative Variation. Leaf morphology is very variable both within and between species in Proteaceae, particularly in Australian taxa, although it is difficult to relate this to ecological factors (Nicotra et al. 2011). Genes & Genomes. That palaeo-polyploidy has been involved in the evolution of chromosome number in the family is questionable (Stace et al. 1998). There is very considerable variation in chromosome and genome size that correlates with phylogeny/habitat, but much less with chromosome number; there have been changes in stomatal size (in part) subsequent to and independent of changes in genome size and chromosome number (Stace et al. 1998; Carpenter et al. 2010a; Jordan et al. 2014). Chemistry, Morphology, etc. For distinctive fatty acids in the seeds, see Badami and Patil (1981); fof cyanogenic glycosides, see Swenson et al. (1989). The roots have 4-7 protoxylem poles (e.g. Watt & Evans 1999). Sieve tubes have sieve areas for most of their length. Nodes in Panopsis appear to be pentalacunar, while those of Finschia are trilacunar, although with some variation in the number of traces departing from each gap (Catling 2010). Cotyledonary nodes commonly have split laterals (Naubauer 1991), however, the distribution of this character is unclear. Stem lenticels are often horizontally elongated (Keller 1996). For stomatal orientation on the lamina, see Carpenter et al. (2010a). The flower-pairs common in the family represent reduced inflorescence branches (Douglas & Tucker 1996a). For variation in floral orientation, see Douglas and Tucker (1996a, b); the flowers may be mirror images, as in Orites. In Grevilleoideae, the basical floral orientation is orthogonal to the bract immediately subtending the flower, but the position of this bract relative to the axis that bears it varies and the carpel is often (?always) oblique (Douglas & Tucker 1996a; Mast et al. 2015). Placospermum has vertically monosymmetric flowers in which there are three staminodes and only the single adaxial stamen is fertile - see image. Proteaceous flowers can be interpreted as being dimerous (Ronse De Craene 2016b). Flowers of Proteoideae-Conospermeae show considerable developmental variation (Douglas & Tucker 1997). There is no evidence that the perianth is derived from a biseriate structure, and the individual perianth members - of Macadamia, at least - have three traces; for the family, 1-5 bundles supplying each tepal are reported (Weston 2006). A small, almost spine-like process that is described as a Vorlaüferspitze (Douglas & Tucker 1996c) occurs just abaxial to the apex of the perianth members (see Kaplan 1973) in Persoonioideae and also elsewhere in the family. Anthers of Stirlingia, Franklandia, Conosperma and Synaphea have an exothecium, but no endothecium (Venkata Rao 1971). The nectary has very variable vasculature and it is also very variable in morphology; it is best considered to be an enation rather than (a) modified stamen(s) (Venkata Rao 1967; Douglas & Tucker 1996c). The stigma may be papillate, or it is more or less enclosed, with exudate (Matthews et al. 1999); due to the early growth of the carpel, it may be in a more or less abaxial position on the carpel/style. Although the ovules are straight, the funicles can be quite long and strongly curved (Venkata Rao 1962). The position of the embryo sac in the ovule varies considerably (Venkata Rao 1971). Although a nucellar cap seems to be common, it can be difficult to distinguish from files of cells produced by the division of hypodermal nucellar cells (e.g. Jordaan 1945a, see also Venkata Rao 1962). Manning and Brits (1993) suggested that there had been much misinterpretation of fruit/seed anatomy; their interpretation is followed here. Testa and tegmen variation is extensive, partly because the fruits are sometimes indehiscent (Venkata Rao 1971; Corner 1976). The ovary wall may also be adnate to the integuments (so the fruit is a sort of caryopsis?!). The testa and/or the tegmen may be multiplicative. Endosperm and endosperm haustorium development is variable; the endosperm of Lomatia (Grevilleoideae) has 1-celled outgrowths over its surface (Venkata Rao 1962). Cotyledons of Bellendena are not cordate are they often are elsewhere in the family. For additional general information, see Johnson & Briggs (1963, 1975: including chromosome lengths! ), Venkata Rao (1971) and especially Weston (2006), for general chemistry, see Hegnauer (1969, 1990), for polyol distribution, see Bieleski and Briggs (2005), for nodes, see Catling and Gates (1998), for Al accumulation, see Webb (1954), for the life history of Grevillea s. str., see Brough (1933), for pollen, see Dettmann (1998), Sauquet et al. (2006), Sauquet and Cantrill (2007), and Blackmore and Barnes (1995: development, Garside's Rule), for some embryology, see Venkata Rao (1959) and Jordaan (1945b), and for a survey of seed coat anatomy, see Takhtajan (2000). Phylogeny. For a summary of phylogenetic studies in the family, see Weston (2014). Although the subfamilies recognised here seem to be fairly solidly supported, relationships between them are less clear. Thus the summary tree in Weston and Barker (2006) and Weston (2006) suggest that Persoonioideae and the monotypic Bellendenoideae are sister taxa (see also Sauquet et al. 2009b); the distinctive Carnarvonia (fully compound leaves) and Sphalmium (stylulus short), sometimes segregated as subfamilies (as in The Flora of Australia), may be immediately related, and although definitely to be included in Grevilleoideae, further relationships within that clade are unclear. Although understanding relationships between the major clades was not the focus of the study by Mast et al. (2012), they recovered the relationships [[Persoonoideae + Bellendenoideae] [Grevillioideae [Proteoideae + Symphionematoideae]]]. Persoonioideae is largely Persoonia itself; for relationships in the subfamily, see Holmes et al. (2018). Relationships in Proteoideae are explored by Barker et al. (2002); the Australian Isopogon and Adenanthos are sister to a clade that represents most of the subfamily, but not including Protea and Faurea (support strong for this set of relationships); unfortunately Eidothea, a distinctive genus segregated as Eidotheoideae in The Flora of Australia, was not included. Sauquet et al. (2009b) found some support for [Agastachys + Symphionema] as sister to Proteoideae, within which Eidothea was involved in a basal tritomy. For the phylogeny of Leucadendron, see Tonnabel et al. (2014a, b), and for that of Protea, see Mitchell et al. (2017 & references). Within Grevilleoideae, Sauquet et al. (2008b) found some support from the topology [Macadamieae [Banksieae + Roupaleae]]; Carnavonia was weakly supported as sister to Macadamieae. For relationships in Hakea, which includes Grevillea and a couple of small genera, see Mast et al. (2012, esp. 2015); G. endlicheriana, from S.W. Australia, is sister to the whole of the rest of the clade and Hakea s. str. is monophyletic. Classification. For a new subfamilial/tribal classification, the outlines of which are followed here, and a generic checklist, see Weston and Barker (2006) and Weston (2006). Banksia is to include Dryandra (Mast et al. 2005; see also Thiele et al. 2015) while Hakea may also be expanded to include Grevillea and Finschia (Mast et al. 2015 for possible options). Previous Relationships. The testa anatomy of Proteaceae is similar to that in Papaveraceae, Chloranthaceae and Aristolochiaceae, for what that is worth.